It was the last weekend of March Break. Most families and their kids likely had their fun filled during the week and were now getting ready to go back to school or work. 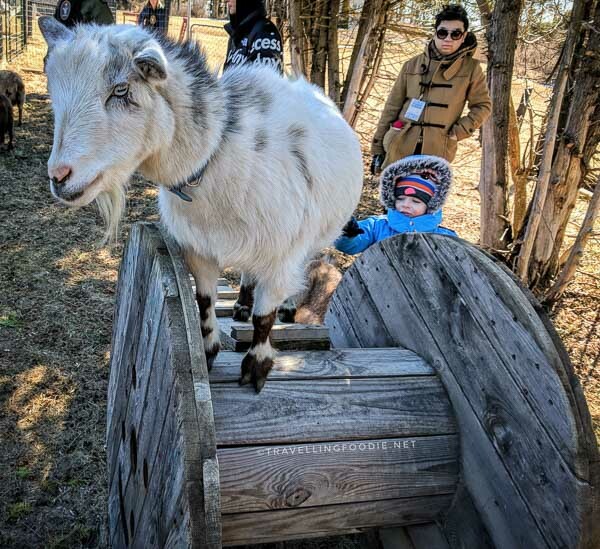 For us big kids, we were invited by the Municipality of Port Hope to spend a day there to experience activities in their heritage town, located only an hour’s drive away just east of Toronto. We stayed overnight at Hotel Carlyle, a historic building originally built in 1857 as a branch of The Bank of Upper Canada. 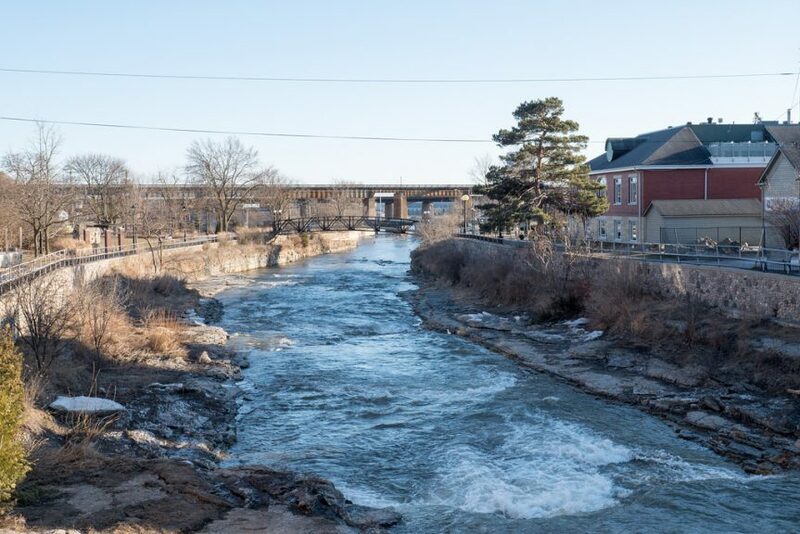 Most people might have heard of Port Hope’s annual salmon migration event from Lake Ontario up the Ganaraska River, the Float Your Fanny Down the Ganny, or their Festival of Trees held at the Capitol Theatre during the Christmas time. When my friends asked me “What are you going to do there when neither one is happening at this time of the year?”, I told them, there are actually other things to do in Port Hope than what the town’s best known events! March is not only just March Break, but it is also Maple Month. 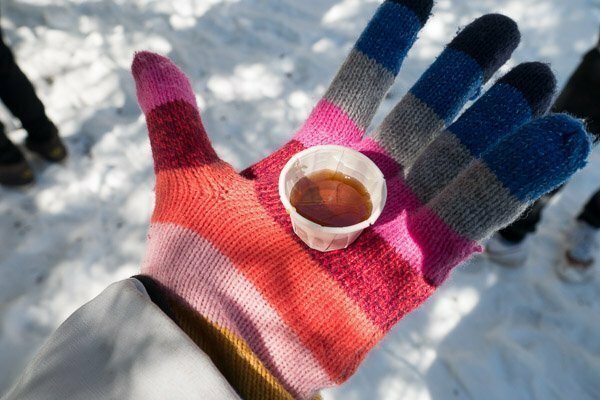 Therefore, Maple Syrup Festivals around in Ontario starts too. 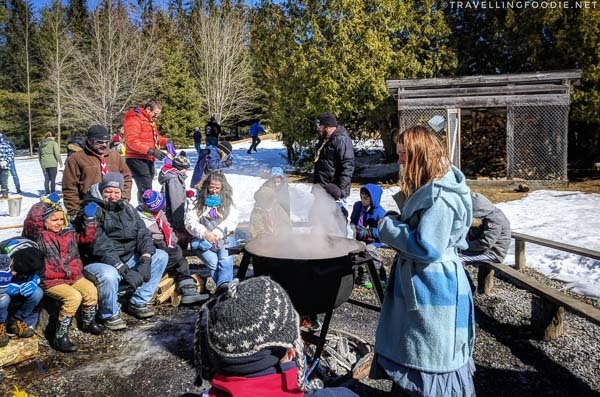 March 17 marks “Maple Syrup Day” at the Ganaraska Forest Centre, held annually by the Ganaraska Region Conservation Authority. 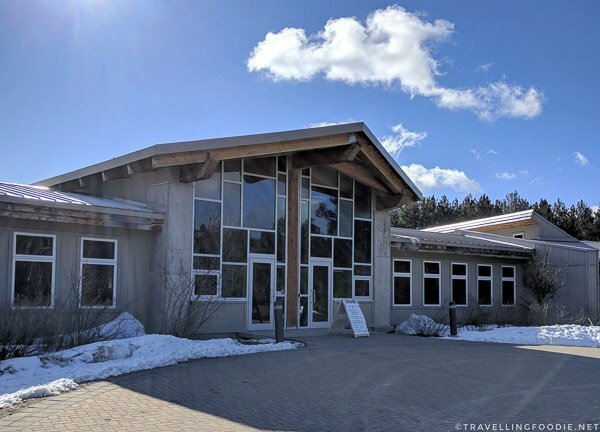 Ganaraska Forest Centre is located about a 20 minute drive from downtown Port Hope and is located in the heart of 11,000-acre Ganaraska Forest. The centre itself is a multi-use facility for various community activities and also used for outdoor educational purposes. 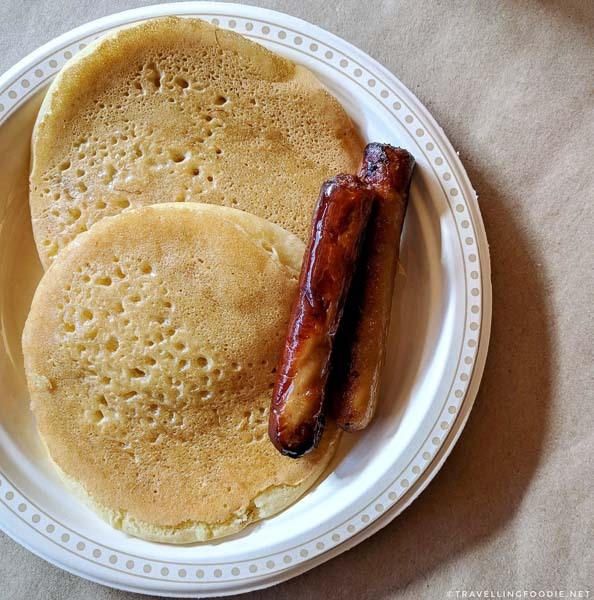 We arrived in the morning and started our day in the Great Hall with a lovely warm serving of pancakes and sausages, all topped with Maple Syrup of course. The hall was filled with highly spirited live music, and also had a station for face painting to keep the kids busy while everyone enjoyed their breakfast. 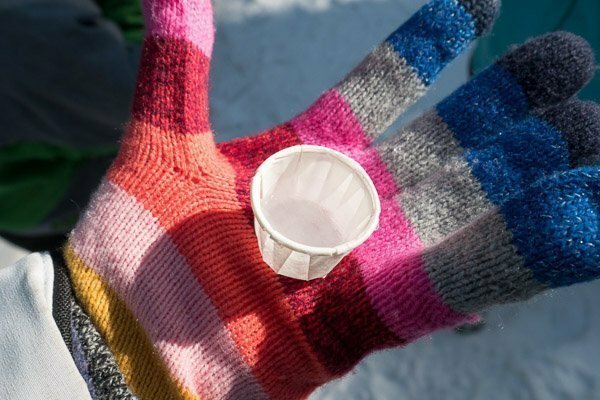 We then joined the Sugar Shack tour where we were taken down to the forest to learn about the history of traditional maple syrup production, and even got to sample raw sap in its liquid form before it is turned into syrup. At the campfire pit, we learned how sap was traditionally evaporated via a big pot cooked over an open fire. Did you know? 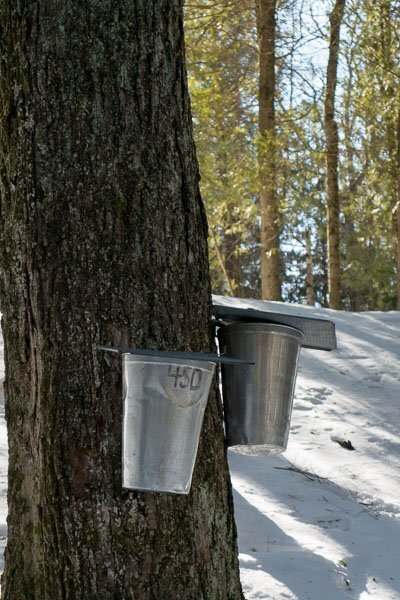 It takes 40 parts of sap to make 1 part of maple syrup. That is a lot of liquid sap to evaporate! 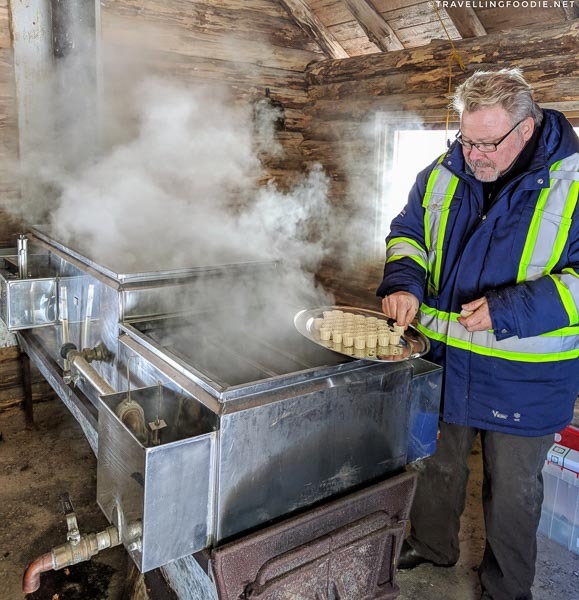 It is no wonder that Maple Syrup is known as Canada’s liquid gold as it takes a lot of work and time to make the sweetness we all enjoy on our pancakes! Nowadays, there are commercial evaporators used to shorten this process. Even our guide told us they have no shortage issue with collecting sap, but it still tends to be a slow rate to turn sap into maple syrup. Tree sap in liquid form looks just like water. Tree sap after evaporation and made into golden maple syrup. 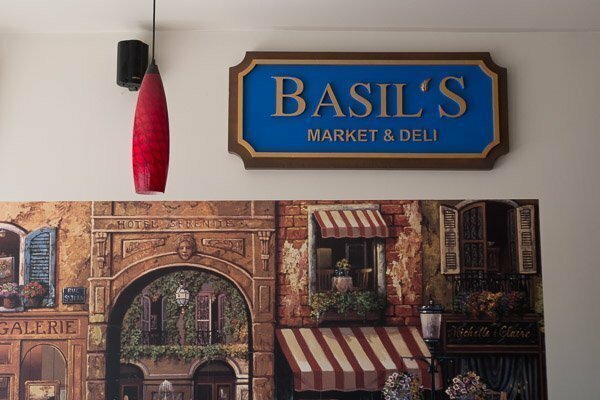 After enjoying the Maple Syrup, we headed back into town for a small lunch at Basil’s Market & Deli. They offer fresh made deli sandwiches in the sit-down area and sell various market items for locals to take home. 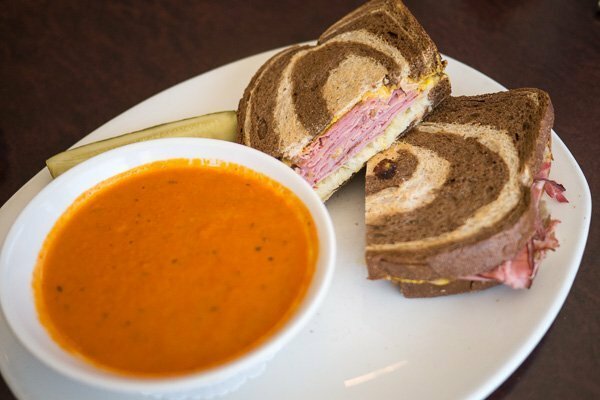 Reuben sandwich with Tomato soup ($13.99 daily special). 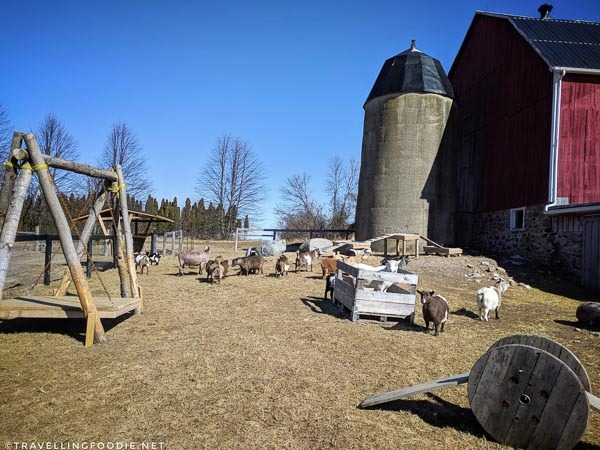 We were greeted at Haute Goat Farm by one of the owners Debbie Nightingale, who told us that she left Toronto and moved to Port Hope so that she can own her own farm and animals in the peaceful country side. She decided on goats! 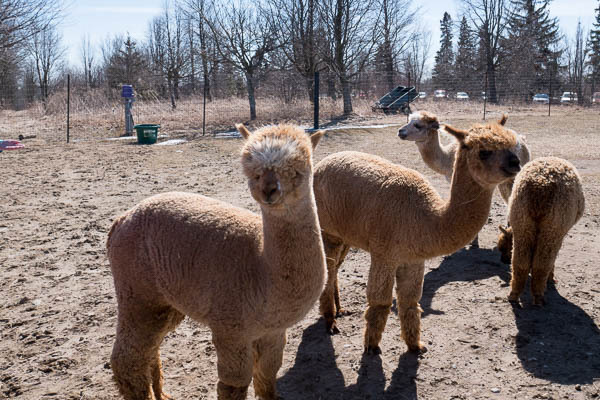 And so she started a farm with Nigerian Dwarf goats, Icelandic horses, chickens, and also the recent addition of alpacas. Haute Goat Farm is no ordinary goat farm where you stand behind fences and just look at the goats roaming around They also offer farm life workshops such a “Milk a goat make cheese”, “How to Create an Apothecary Garden”, “Basics of beekeeping”, “Secret World of Mushrooms”, and yes, “Goat Yoga”. 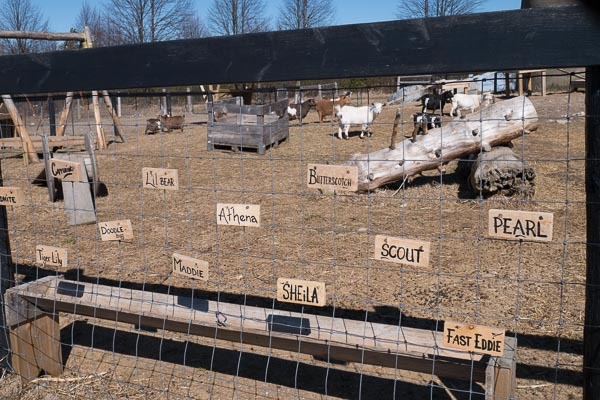 The goats’ names are hung on wooden tags around their playground fence. However, we were offered a different experience that day, the “Haute Goat Shmurgle”. What is a shmurgle? 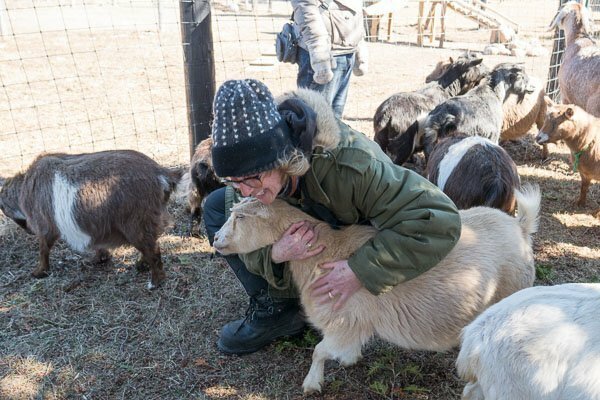 Turns out shmrugle is a word invented by this farm and it means goat hugging. So yes, our experience was running and walking with goats and hugging them. 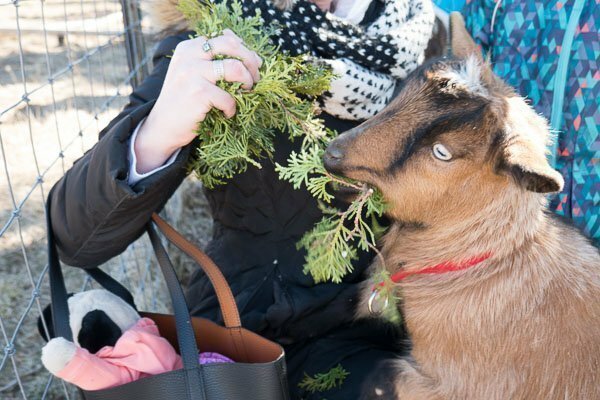 Guests got to play and interact with goats some of which were on leashes. 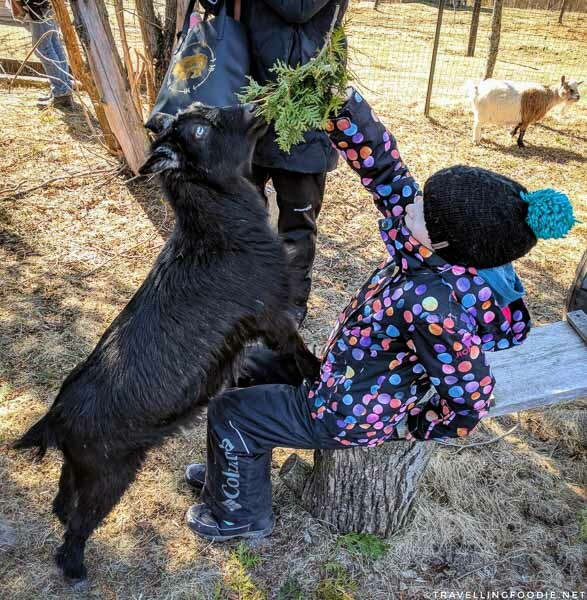 Owner Debbie explained that the younger goats tend to go a bit out of control so they had to be put on a leash. She was right! My goat was Lil Bear, the youngest of the herd of goats, and she was jumping and screaming the entire time as she did not want to be leashed. We eventually let her off the leash and she happily ran away with the rest of the herd! The goats acted like puppies, excited to be unleashed and able to run about the fields. 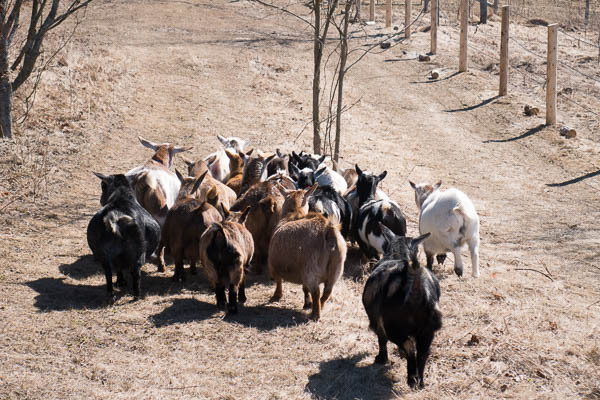 A herd of goats is referred to as “trip”. Therefore, these goats on Debbie’s farm are known as “Tripping Billies”. Their long fur keeps them warm in the winter, but they hate the rain and the wind. They can produce 1 to 2 quarts of milk per day, and they contain 6% butterfat content, which is higher than the 4% cow milk is. Nigerian goat offspring are known as “kids”. You can watch the goats live on their 24-hour goatcam so for those nights that you cannot fall asleep, instead of counting sheep, you can now count goats. 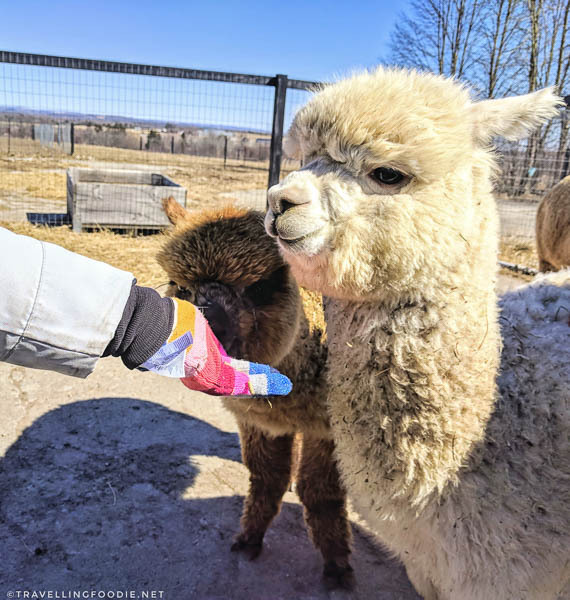 On Haute Goat Farm, there are also alpacas, and we were fortunate enough to be allowed into the fencing area to pet and feed them. They are very docile and gentle animals but were suspicious of us when we offered them food. 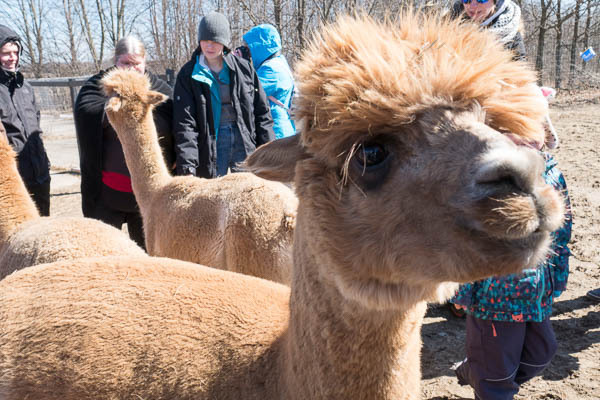 The alpacas are a recent addition to Haute Goat Farm so the farm held a naming contest for them, and a lot of them ended up with modern names such as Star Wars characters – there was a Princess Leia, Yoda, and Luke Skywalker among these alpacas. This experience was definitely one of the best things to do in Port Hope. We cannot wait to go back to Haute Goat Farm for their other workshops. 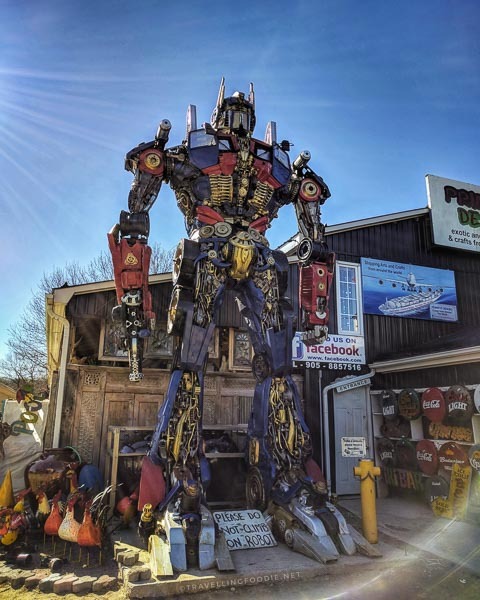 Prior to dinner time, I suggested we go visit the giant robots store, Primitive Designs, which is one of the popular attractions in Port Hope. They are not hard to miss at all as the robots stand up to 26 feet high and are easily seen right when you drive anywhere nearby. 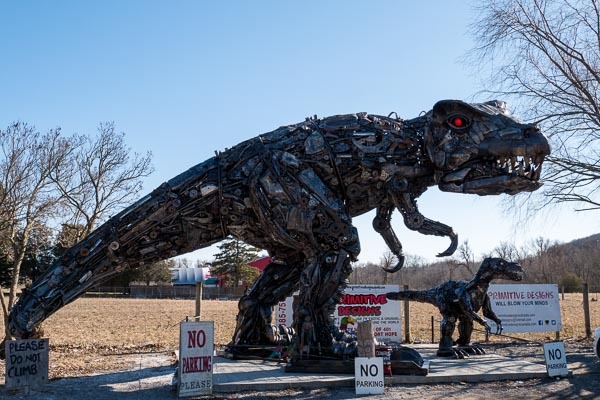 These robots are made from recycled metal and motor vehicle parts. 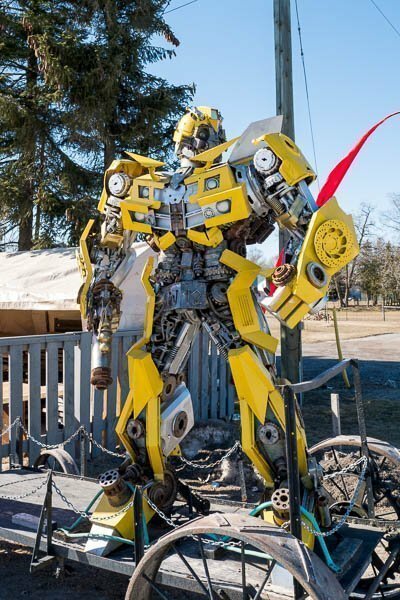 They are known for their Transformers robots, which put them in Port Hope’s popular attractions. Outside, you can easily spot Bumblebee and Optimus Prime. 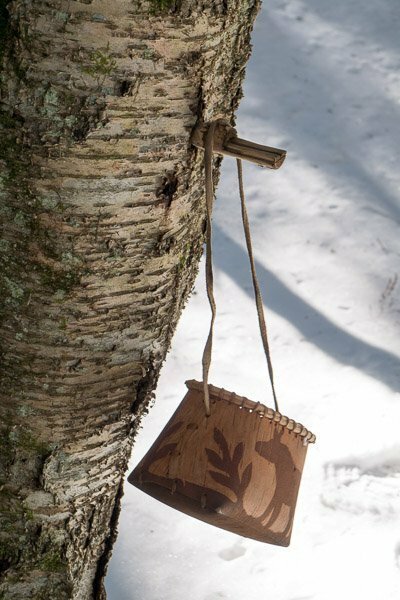 Primitive Designs is a store that imports unique arts & crafts products from around the world. It feels like all the arts & crafts, knick knacks and souvenirs that you find on vacation trips are all gathered here in one single spot. 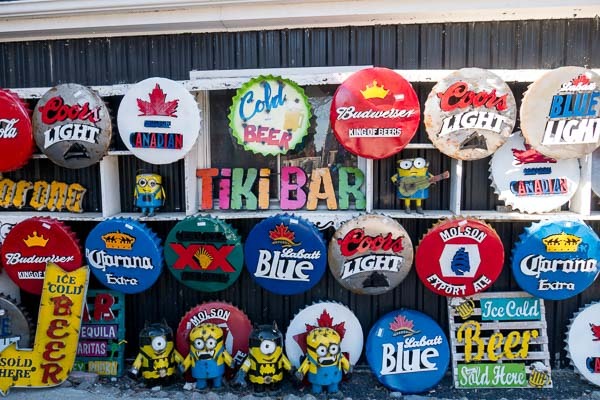 Yes, it includes Tiki bars, hand crafted decorative items, coconut shells, and mosaic plates to name a few. 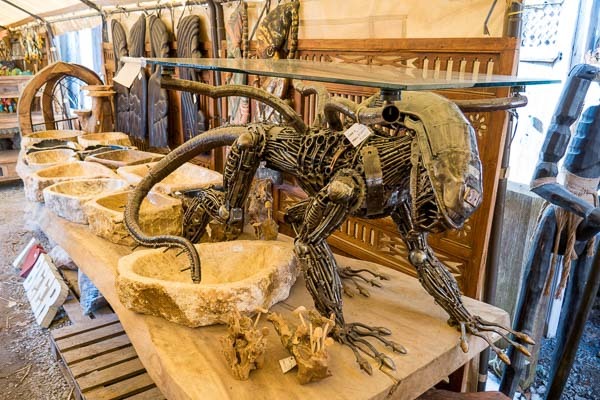 There is even an Alien Xenomorph coffee table there for sale. 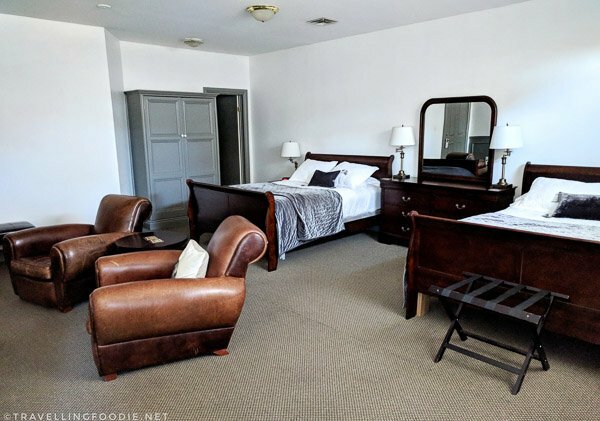 Search for places to eat in Port Hope and you will definitely come across Tratorria Gusto, a fine dining Italian restaurant tucked in downtown Port Hope inside the historic Waddell Hotel. Their menu is color coded with Gluten Free, Vegan, Vegetarian and Dairy Free options, making it very easy to make decisions on food for dietary reasons. They are recognized by the Ocean Wise program where they use only sustainable seafood products whenever possible in their ingredients. Despite being a fine dining restaurant, we find the pricing quite reasonable as well as their quality and portion of food served. We left filling very full. For appetizer, we recommend their Lamb. 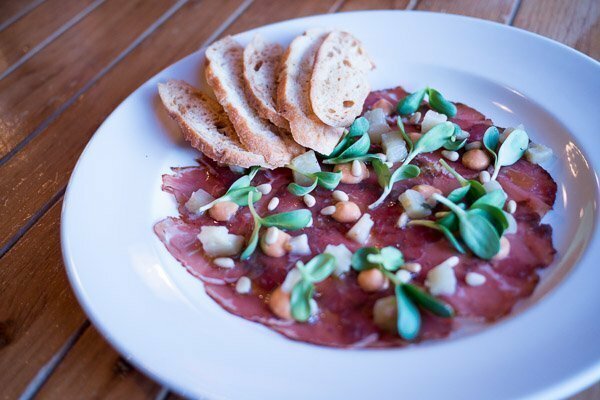 It is not something we had usually seen served as a carpaccio as beef & scallop were the usual common ones on menus. 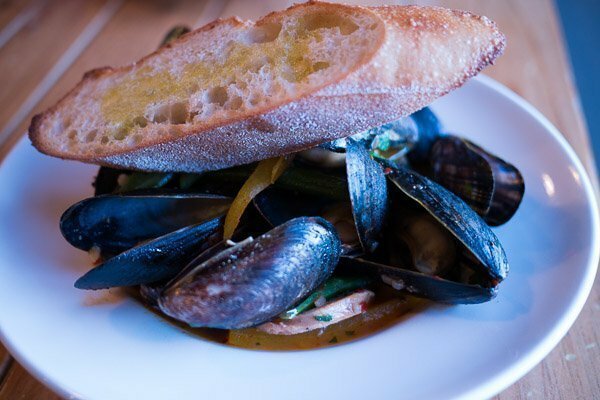 If you would like a kick of spiciness for an appetizer, the steamed Mussels Arrabbiata was another good choice as well. 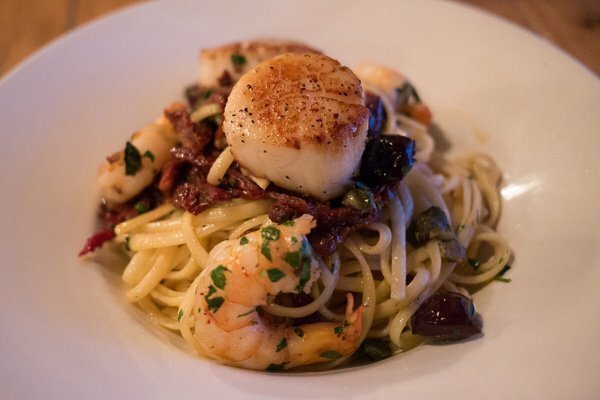 For our mains, we ordered the “free form” striploin steak topped with parsley butter, and a seafood linguine pasta dish called Puttanesca. 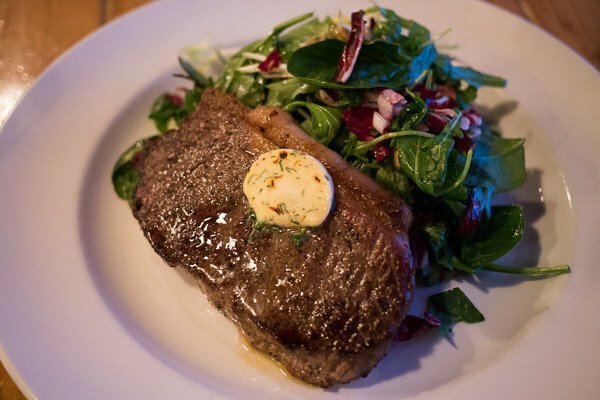 We substituted the sides of roasted potatoes & green beans for the steak with their Verde Salad instead as we wanted to include some healthy greens in our meal. Desserts were definitely welcomed even by the time the menu was handed to us, we were already very full. However, as foodies, we tend to tell others that there is a separate stomach for desserts. We settled for the traditional Italian Tiramisu, and the Apple Riscotta Cake. 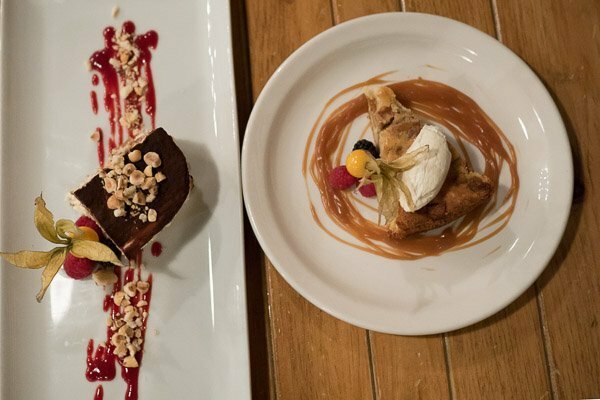 Believe us, it was a hard choice to pick just two desserts out of six choices. Tiramisu ($10) – Coffee soaked lady fingers & whipped mascarpone with cherry coulis, hazelnut & lady finger crumb. Apple Ricotta Cake ($11) – Ricotta and almond cake with brown sugar apples, salted boubon caramel, maple whipped cream. Travelling Foodie Tip: Request a table by the window beside the Ganaraska River. Even though currently it is not in season yet for salmon/trout migration up the river, we were very fortunate to witness several attempts of fish jumping up the river. The sunlight coming in from the window also gives a nice ambiance to your meal. All of the above activities took up our entire day, and by the time we were done having dinner, we were ready to go rest up. 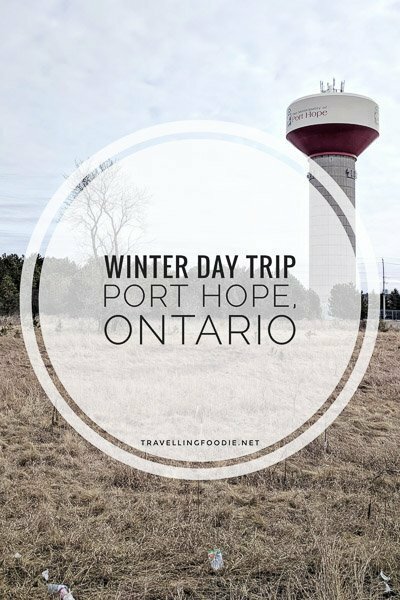 If you’re looking for a short drive out of Toronto to spend a day, we definitely recommend visiting Port Hope. There are different activities to do and explore at different times of the year. Which of the activities above sounded most interesting to you? Comment below, or shoot us an email, or message us on social media! Huge thanks to the Municipality of Port Hope for hosting the trip. As usual, reviews and opinions are entirely our own. You can learn more about Port Hope through their website, or find them in Facebook, Twitter and Instagram. Article and Photos (unwatermarked) by Veronica Chiu. 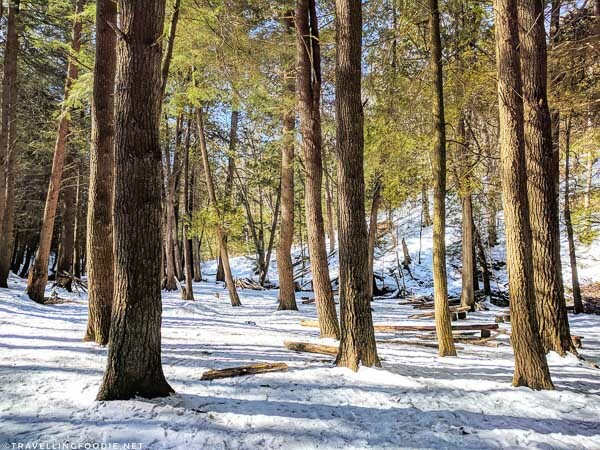 Posted on April 2, 2018 January 1, 2019 by Travelling FoodiePosted in Canada, Food, Ontario, Port Hope, TravelTagged accommodations, activities, events, guides, nature, restaurants, sights and landmarks, tours. Hello, I’m Korean and I’m not good well english. I have first time to watch english blog. But your blog is easy to understand , so I can watch your blog to funny. 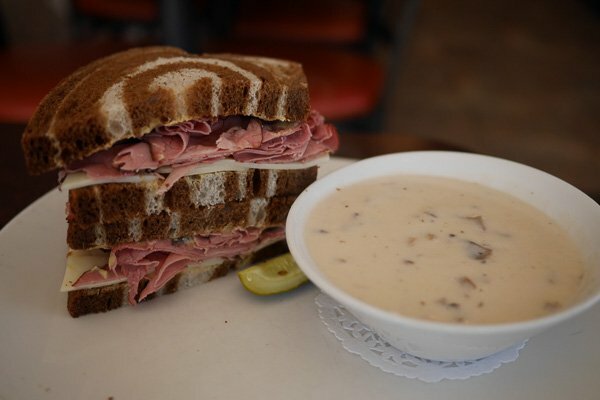 And picture of the food look very delicious, so I envy you. I wonder how do you know this wonderful place and useful tips? For this particular post, the trip was arranged by Port Hope Tourism. However, when I plan on my own, I typically research online thru blogs, social media, travel websites and TripAdvisor. Hope that helps! Thanks for dropping by!